Swansea University International Dylan Thomas Prize – Shortlist announcement! Earlier today the Swansea University International Dylan Thomas Prize was announced. 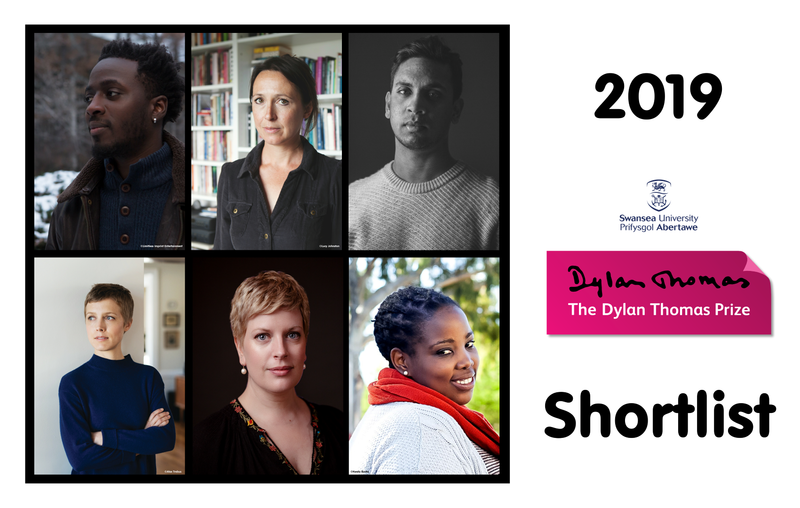 The shortlist was chosen by a judging panel chaired by Swansea University Professor Dai Smith CBE with Professor Kurt Heinzelman; Books Editor for the BBC Di Speirs and award-winning novelist Kit de Waal. American-Ghanaian writer Nana Kwame Adjei-Brenyah (27) for his debut short story collection Friday Black (Houghton Mifflin Harcourt (US) and Riverrun (UK)) which explores what it’s like to grow up as a black male in America, and whose powerful style of writing has been likened to George Saunders. He is from Spring Valley, New York and graduated from SUNY Albany and went on to receive his MFA from Syracuse University. He was the ’16-’17 Olive B. O’Connor fellow in fiction at Colgate University. His work has appeared in numerous publications, including Guernica, Compose: A Journal of Simply Good Writing, Printer’s Row, Gravel, and The Breakwater Review, where he was selected by ZZ Packer as the winner of the 2nd Annual Breakwater Review Fiction Contest. Friday Black is his first book. Debut novelist Zoe Gilbert for Folk (Bloomsbury Publishing) which was developed from her fascination in ancient folklore and the resurgence of nature writing. She has previously won the Costa Short Story Award in 2014. Zoe Gilbert is the winner of the Costa Short Story Award 2014. Her work has appeared on BBC Radio 4, and in anthologies and journals in the UK and internationally. She has taken part in writing projects in China and South Korea for the British Council, and she is completing a PhD on folk tales in contemporary fiction. The co-founder of London Lit Lab, which provides writing courses and mentoring for writers, she lives on the coast in Kent. British-Sri-Lankan debut novelist, Guy Gunaratne for In Our Mad and Furious City (Tinder Press, Headline), longlisted for The Man Booker Prize and shortlisted for The Goldsmiths Prize, The Gordon Burn Prize as well as the Writers Guild Awards. He lives between London, UK and Malmö, Sweden. His first novel In Our Mad and Furious City was longlisted for The Man Booker Prize and shortlisted for The Goldsmiths Prize, The Gordon Burn Prize as well as the Writers Guild Awards. He has worked as a journalist and documentary filmmaker covering human rights stories around the world. Louisa Hall with her latest book Trinity (Ecco) which tackles the complex life of the Father of the Atomic Bomb, J. Robert Oppenheimer through seven fictional characters. Louisa Hall grew up in Philadelphia. She is the author of the novels Speak and The Carriage House, and her poems have been published in The New Republic, Southwest Review, and other journals. She is a professor at the University of Iowa, and the Western Writer in Residence at Montana State University. Trinity is her third novel. 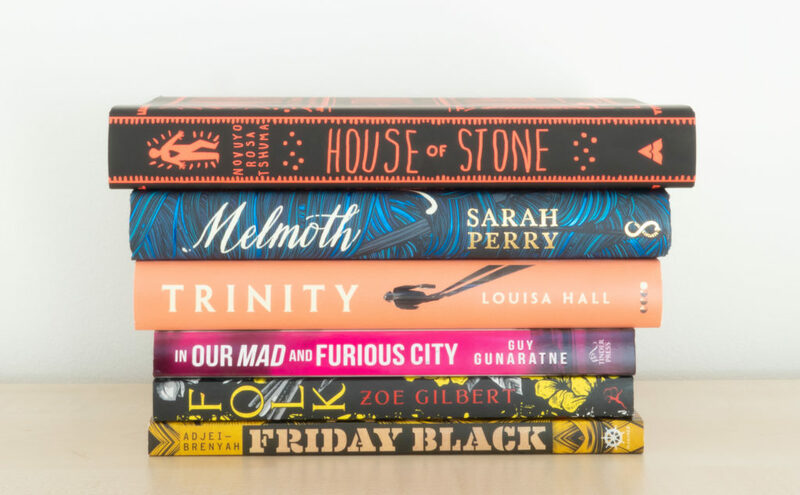 For the second time Sarah Perry has been shortlisted for the Prize this time for Melmoth (Serpent’s Tail), one of The Observer’s Best Fiction Books of the Year 2018, and a masterpiece of moral complexity, asking us profound questions about mercy, redemption, and how to make the best of our conflicted world. Sarah Perry was born in Essex in 1979. She has been the writer in residence at Gladstone’s Library and the UNESCO World City of Literature Writer in Residence in Prague. After Me Comes the Flood, her first novel, was longlisted for the Guardian First Book Award and the Folio Prize and won the East Anglian Book of the Year Award in 2014. Her latest novel, The Essex Serpent, was a number one bestseller in hardback, Waterstones Book of the Year 2016, the British Book Awards Book of the Year 2017, was shortlisted for the Costa Novel Award and Dylan Thomas Award, and longlisted for the Bailey’s Women’s Prize for Fiction 2017. Her work has been translated into twenty languages. She lives in Norwich. The winner will be announced on Thursday 16th May at Swansea University’s Great Hall, just after International Dylan Thomas Day on 14th May. The International Dylan Thomas Prize was launched in 2006. It is one of the most prestigious awards for young writers, aimed at encouraging raw creative talent worldwide. It celebrates and nurtures international literary excellence. Worth £30,000, it is one of the UK’s most prestigious literary prizes as well as the world’s largest literary prize for young writers. Awarded for the best published literary work in the English language, written by an author aged 39 or under, the Prize celebrates the international world of fiction in all its forms including poetry, novels, short stories and drama. The prize is named after the Swansea-born writer, Dylan Thomas, and celebrates his 39 years of creativity and productivity. One of the most influential, internationally-renowned writers of the mid-twentieth century, the prize invokes his memory to support the writers of today and nurture the talents of tomorrow.